First full collection of poems. "Donald Wolff's Soon Enough is a book haunted by danger, affliction, imminent disasters, and his poems are talismans against this ferocious onslaught. With these poems, Wolff stares down catastrophe and peril, and celebrates the sheer wonder of our survival-- the glory of our sad, fragile, beautiful lives." "Soon Enough's landscape is western, cut through by canyons and rivers, populated by bear, even the bison. Reality arises from the details of a life fully lived there: fatherhood, work, memory and hope. The best poems in this collection are the darkest, the squirrel in the belly of a coyote, a man in the grip of his life." 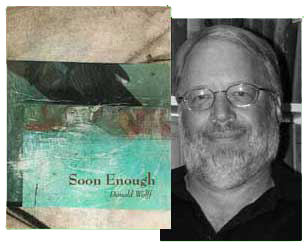 "Soon Enough is a remarkable book of poetry if only for its range, the control of many contemporary modes--prose poems, short lyric poems, long line ekphrastic poems, multi-sectioned symphonic poems--each one with authority and a mastery of craft. And throughout, there is a sure, accessible, and memorable voice. This is a book of grit and gravity, of grace pushing for all it can against mortality. Wolff risks a great deal personally and intellectually, and cuts down to the bone, to the essential meaning." DONALD WOLFF lives and works in La Grande, Oregon. At Eastern Oregon University, he teaches courses in creative writing and applied linquistics, co-directs the Oregon Writing Project, and currently serves as Chair of the Division of Arts and Letters. He was born and raised in California, which informs many of his poems about the past, while life with his family in La Grande has so far guided many of his poems about the present. In May 2004, he was a resident writer at Fishtrap. His chapbook, Some Days, was printed in 2004 by Brandenburg Press.